Click here to read "Committing to inclusive growth: Lessons for metro areas from the Inclusive Economic Development Lab," a companion paper on building inclusive cities. Graphics and corresponding text were replaced on page 25 to reflect updated information regarding San Diego’s talent pool. On Feb. 7, 2018, Figure 3a was corrected to reflect the percentage point change in employment share from 1980-2010. Inclusive growth remains the exception rather than the rule in most of America’s metropolitan areas. Local communities will have a better chance of addressing today’s defining economic challenge if it is reframed as one affecting both employers and workers. This report, Opportunity for growth, aims to do that by exploring the connection between economic inclusion and growth in U.S. metro areas, the implications for businesses and workers, and how regional economic strategies can eliminate barriers that are hindering inclusive growth. An advanced economy not working for all. The U.S. economy has not raised living standards for most residents for several decades. New evidence suggests that the bottom 50 percent of earners—half of American workers—have experienced zero income growth before taxes and transfers since 1980. The once-assured prospect that children would enjoy higher incomes than their parents has diminished. While nine out of 10 children born in 1940 had higher earnings at age 30 than their parents at the same age, for those born in 1980, the number dropped to one in two. Cities and regions are a critical scale at which to address the challenge. Diminished mobility and rising inequality come to ground in the nation’s cities and metro areas. Only 11 of the 100 largest metropolitan areas have matched their employment recoveries with expanding labor productivity and broad-based income gains. Cities and regions are not only the locus of this disturbing economic trend, but also a critical scale at which to address it. That means that national policies related to tax, trade, and competition, while critical to addressing inequality, often fail to account for differences in the local opportunity structure in a nation as large as ours. Moreover, the key organizational coalitions that can ensure inclusive growth operate locally. For decades, workforce development boards, community development organizations, social service agencies, faith groups, and other civic and public institutions (sometimes called inclusion actors) have led the nation’s bottom-up fight against social inequities, person by person, block by block. Inclusion actors were complemented by a separate set of growth actors—employers and the chambers of commerce, business leadership groups, and economic development groups that represent them—that focus on the overall growth of local economies. These groups have led on efforts to create jobs, develop industries, promote economic growth, and attract businesses. 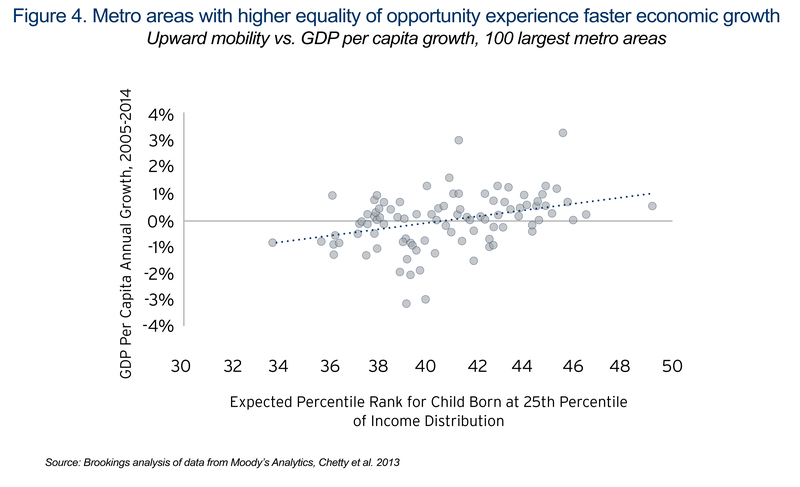 Reducing barriers to economic opportunity in U.S. metro areas can enhance economic growth. The challenge historically has been that the growth and inclusion camps usually operate on separate tracks, driven by different cultures and politics, pursue distinct goals, and respond to non-overlapping metrics. This dynamic fails to grasp the interplay between opportunity and growth. Indeed, recent research from Katharine Bradbury and Robert Triest found that metro areas where low-income children experienced higher upward mobility underwent faster subsequent per capita income growth, controlling for other factors that influence growth. In other words, greater equality of opportunity yields greater growth. Second, economies that extend opportunity widely not only maximize their productive potential, but also minimize the fiscal and social costs of exclusion. These costs are significant. Childhood poverty—one outcome of insufficiently inclusive growth—costs the U.S. economy an estimated $500 billion a year, or four percent of GDP, due to lost productivity, higher crime and incarceration, and larger health expenditures. Cities end up bearing these costs, at the expense of other important investments in growth and opportunity. The final cost of unequal opportunity gets beyond the numbers. Inequality of opportunity provokes hostilities that fray social and political cohesion and good governance, which affects economic growth. Growth is necessary to make regional economies more inclusive. Broad-based opportunity matters for local growth, but the reverse is also true. Economic expansion has not always led to shared prosperity, but it will be hard to achieve inclusion without sustained overall growth and connecting more people to key segments of the advanced economy. Three reasons bear this out. One reason is that faster metro-level growth creates the tight labor markets that make broad-based wage gains more likely. One study found that a 10 percent increase in metropolitan employment raises average real earnings per person by around 4 percent, gains that are greater in percentage terms for African-Americans, lower-income individuals, and workers with less education. The way regions grow also matters: elements of the advanced economy, especially innovative industries and tradable sectors, offer better pay and opportunities for upward mobility. Yet, compared to the economy overall, female, African-American, and Hispanic workers remain underrepresented in tradable industries and the STEM workforce. Finally, economic growth generates the wealth and tax revenues needed to support public goods on which lower-income households disproportionately rely. The pathways to opportunity are highly dependent on the provision of quality public services. Yet, in many communities, public goods are eroding after decades of slow growth, underinvestment, and mounting fiscal pressures. Economic development organizations have a role to play in addressing barriers to inclusive growth. These trends signal a complicated era for local leaders—they must simultaneously deliver environments in which firms and industries can thrive and create good jobs while also creating systems and networks that help lift up workers and communities, especially those that have been historically disadvantaged. Inclusive growth is a process that encourages long-run growth (growth) by improving the productivity of individuals and firms in order to raise local living standards (prosperity) for all (inclusion). Access barriers that isolate individuals in particular communities from economic opportunity. 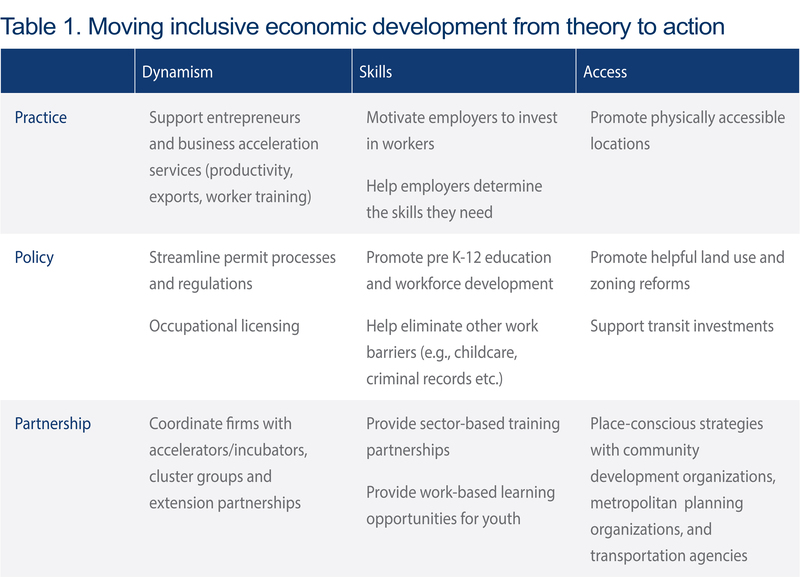 Moving inclusive economic development from theory to action will require deploying these organization’s tools in service of firms, people, and communities. There is no one way to accomplish this shift, but rather several sensible pathways involving new practices, policies, and partnerships with additional metropolitan systems related to workforce development, community development, transportation and land use, and innovation and entrepreneurship. In many ways, EDOs are ideal to anchor inclusive growth coalitions given their distinct role as regional agenda setters, conveners, or collaborator-generals. Yet, this type of role for economic development organizations and other growth actors remains the exception. EDOs will need to address and sometimes develop the goals, norms, and incentives that drive their operations. To do so, they will need to convince their members, boards, and partners that this reflects their strategic interests, using compelling evidence. In other words, a change in narrative is required. Brookings undertook this process with Indianapolis, Nashville, and San Diego as part of the Inclusive Economic Development Learning Laboratory. A companion paper, Committing to inclusive growth, documents the process the three EDOs carried out to develop their narrative—both the successes and challenges— and offers practical guidance to other EDOs to take similar actions. Inclusive growth coalitions can address barriers by stimulating dynamism and job creation, endowing workers with the skills they need to fill good jobs, and ensuring all communities can physically and socially access job and educational opportunities. Often these coalitions do not yet exist and building them takes time and resources. But preparing a broader and more diverse set of firms, workers, and communities to reach their productive potential offers a compelling opportunity for growth. Metropolitan America should seize it.